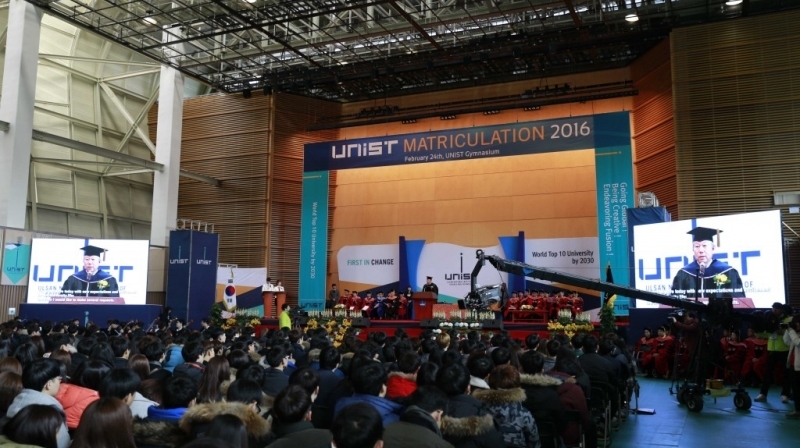 UNIST President Mooyoung Jung is delievering a congratulatory speech at 2016 Matriculation. "Congratulations on your acceptance to the UNIST community!" In the morning of February 24th, inside UNIST Gymnasium was charged with energy and hope, as members of the Class of 2020 officially began their undergraduate journey at the annual Matriculation ceremony. 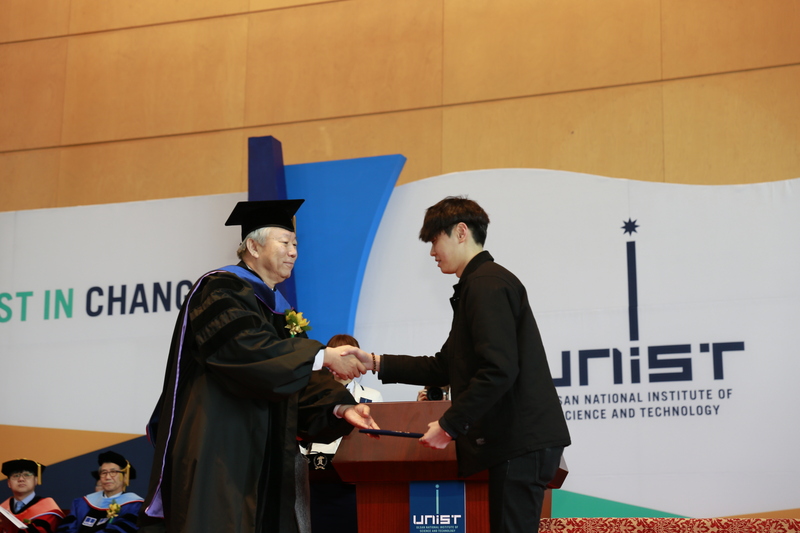 The ceremony featured the awarding of students with outstanding entrance scores, followed by greetings and remarks by President Mooyoung Jung and other distinguished guests. 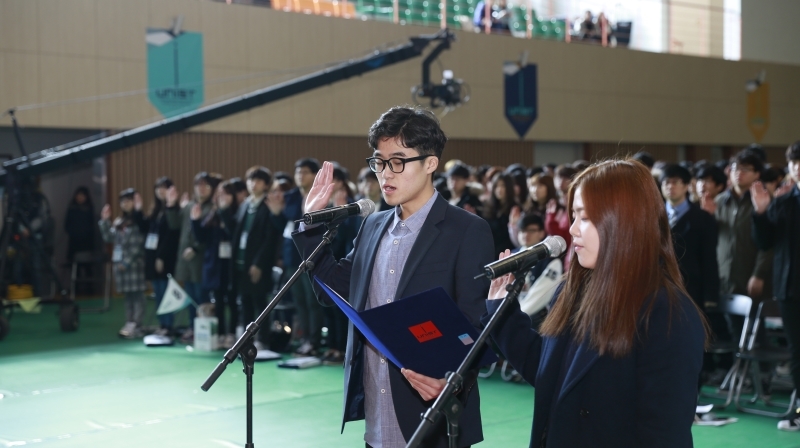 The Oath of Freshmen was also delivered by student representatives, SangHee Park (CheongJu ShinHeung High School) and SeungJin Lee (InCheon HyoSung High School) on behalf of the incoming freshmen for 2016. Student representatives, SangHee Park (left) and SeungJin Lee (right) are delievering the Oath of Freshmen. 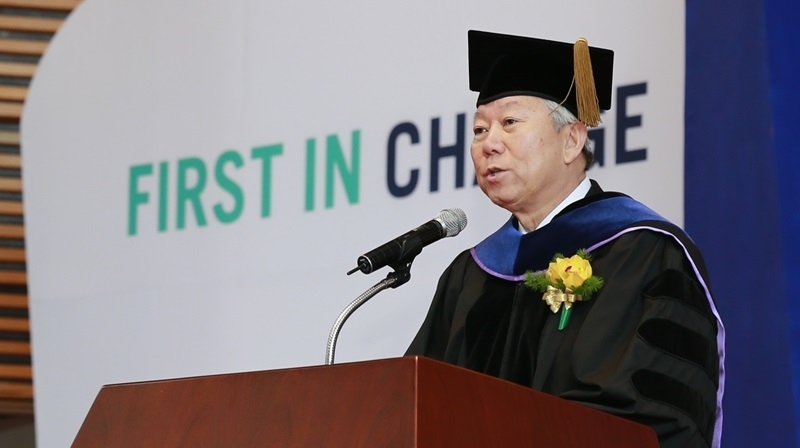 President Jung welcomed the 400 members of the Class of 2020, urging them to have the confidence to try again and to act independently and responsibly, to have a clear goal and vision to push themselves forward, to become a true leader who can manage and take care of others in need, and to be responsible for your actions. This year’s incoming freshmen came through a competition of 87.53 to 1 in regular admission and a competition of 9.38 to 1 in early admission. Moreover, they are the first group of students, entering UNIST since its recent status change as a government-funded research institute. The ceremony was followed by the presentation of scholarship certificates to the students with outstanding entrance scores. 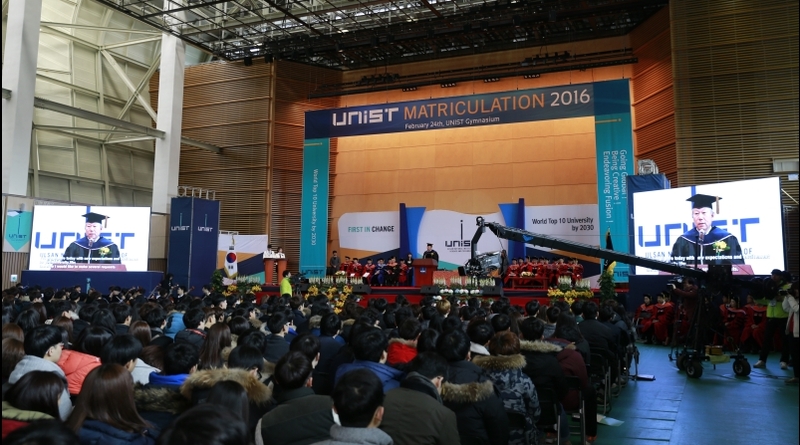 This “Uni-Star Scholarship” was given to four students, SangHee Park (CheongJu ShinHeung High School), SeungJin Lee (InCheon HyoSung High School), JaeUng Lee (Gyeonggi Science High School), and DongGeun Yoon (GeumCheon High School).